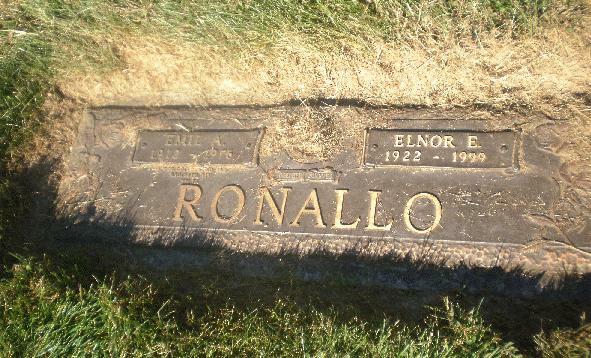 Judith Ann Ronallo; married -- Nolan. Elnor's obituary was published in the "Pittsburgh Post-Gazette" (Pittsburgh, Pennsylvania) on Monday, February 15, 19996 (see scan below). 1930 census, East Pittsburgh, Allegheny County, Pennsylvania; roll T626-1962, ED 583, page 11B, line #96, dwelling #129, family #212. 1940 census, East Pittsburgh, Allegheny County, Pennsylvania; roll T627-3402, ED 2-162, page 18B-19A, line #80, household #340. Ancestry Family Tree data "RONALLO FAMILY TREE" posted by "judynolen1". scan courtesy of Sandra Garrity (). Pennsylvania, Veterans Burial Cards, 1777-2012; http://www.ancestry.com. Pennsylvania, Veteran Compensation Application Files, WWII, 1950-1966; http://www.ancestry.com. Ancestry Family Tree data "DANIELLE RONALLO FAMILY TREE" posted by "Danielle Ronallo". Ancestry Family Tree data "DOWLING FAMILY TREE" posted by "dowling11755". 1930 census, 813 Railroad Street, Wilkins, Allegheny County, Pennsylvania; roll T626-1992, ED 860, page 4B, line #87, dwelling #71, family #70.